In the USA, Frank Shoemaker is to sue the Nebraska Motor Vehicle Department for refusing to issue him with the number plate ‘NE 420’. The authority’s grounds for complaint are based on a vague and perceived connection with drugs. Apparently, 20 April (‘4/20’ in the American manner) has been unofficially designated National Pot Smoking Day, although quite why they should even recognise such a fringe event is a mystery. Other tenuous and diverse objections to ‘April 20’ cite the anniversaries both of the Columbine High School massacre (1999), and Hitler’s birthday (1889). Of course, countless other contentious ‘dates’ could equally fall foul of such over-zealous monitoring. The point is that each state operates its own system of ‘vanity plates‘ whereby you can chose up to seven letters or numbers, and one space, to create any available and acceptable initials, name or word. Most of the obvious and popular examples will have been snapped up many years ago, but there is still room for creative variations. When you consider that any character can comprise a number or letter, the total possible combinations run into billions. It is interesting to note that, had we have used only letters from the start over here, we would not have needed successive changes to the format. There has often been talk of a bespoke system being introduced in the UK and one could easily envisage a rush for registrations on a par with that of the ‘dot.com’ website addresses around the time of the millennium. Such a development could, however, be deemed cynical and tasteless because, whilst it would prove an obvious moneyspinner for the government, it detracts enormously from the charm of the present system, where all combinations have been arrived at completely by chance. 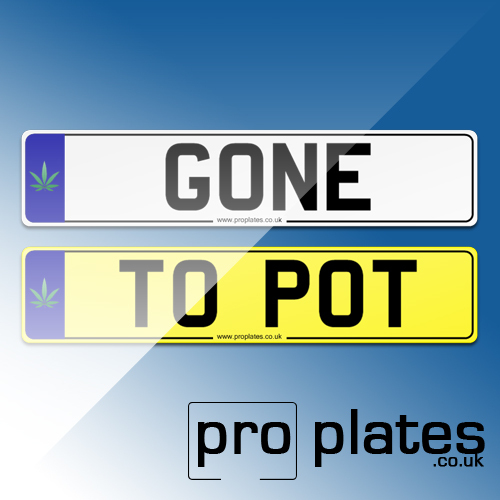 We could make you a show plate for show use at pro plates with this registration.